Womanrunes: The Sun and Moon. Rune of Laughter. Joy. Ease. Oil. Poise. Hilarity. Belly Laughter. Pure Fun. Healing Laughter. Baubo’s Rune. 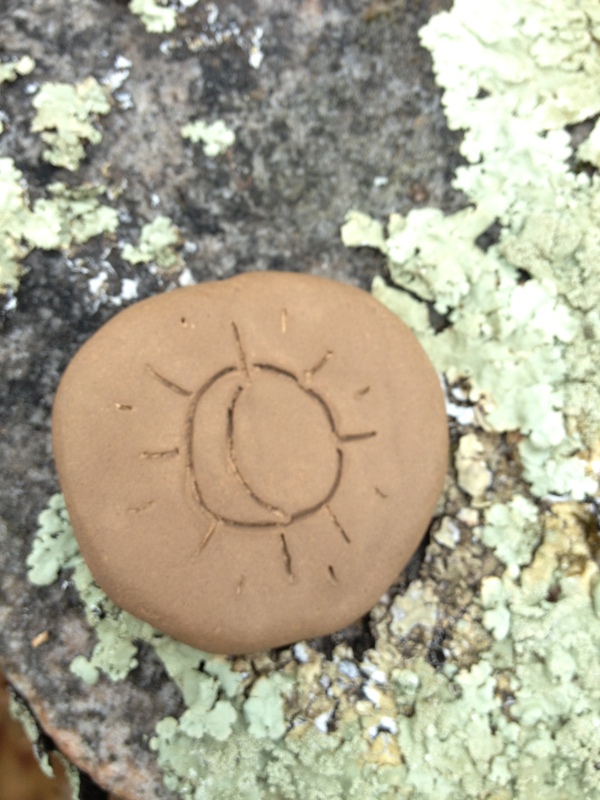 When you draw this stone, take a minute to put down anything else you are carrying, doing, or thinking about. Let your shoulders relax and release. Let the breath move easy down into your belly. Then smile. Smile from your roots up through your branches. Feel joy suffuse you, filling you, bathing you, and laugh. Laugh from your belly. Laugh from your heart. Laugh with the wild abandon of freedom and release. This is a stone of letting go. This is a stone of release and freedom. This is a stone of trusting oneself and what makes you smile. Are you afraid to laugh? Are you scared to let go? Do you fear the loss of control that comes with hilarity? It is time to shake that off. Don’t be afraid. Laugh, sister, laugh. It is time to have some fun! This month I’ve been steadily working on the final handful of Womanrunes that I had left to interpret. I’m actually working on a little book to hopefully unveil during a workshop I plan to offer at the Gaea Goddess Gathering in September. The remaining 18 interpretations that I wrote over the last two months are probably going to be saved for first publication in that booklet! However, this one was the very last stone remaining in the bag and it felt significant for a couple of reasons. One, because it was actually the stone I drew to place on our New Year altar when my husband and I started our biz and life planning work with Leonie Dawson’s Amazing Year Workbook. When I drew it then, I knew it was a message that I needed to have more fun this year. Two, when I drew it this second time in order to do the interpretation for my book, I found myself experiencing a huge amount of reluctance and resistance about actually doing the interpretation. I drew it an entire day before I actually took it down to the woods with me. I found myself making excuses about not going and worrying about somehow not being able to “do” this one. And then I heard: Are you afraid to laugh? Am I…? The first post in my Womanrunes series is available here and all others here. The runes and the names of them come from Shekhinah Mountainwater’s Womanrunes system for which there are no written interpretations available other than the name and one word meanings. I’ve been engaging in a year-long practice of drawing one and then going down to the woods with it to see what it “tells” me–basically, creating what I wish I had, which is a more developed interpretation of the meaning of each womanrunestone. I’m very excited to see your book when it is done. I have been saving your interpretations and hope to make my own runes before the end of the year.